Dr. Dodagoudar has immense experience as an Oncologist in treating all types of Cancer patients in leading centers in Delhi. As a Professor of Medical Oncology, he specializes in Breast Cancer Management and Treatment. 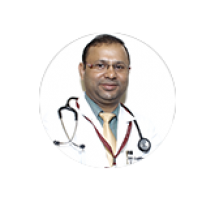 Dr. Chandragouda Dodagoudar completed MBBS from the University of Mysore, MD in Medicine from Rajiv Gandhi University of Health Sciences followed by DNB in Medical Oncology from National Board of Examinations, New Delhi. He has over 15 years of experience of satisfied patients in his field. Dr. Chandragouda Dodagoudar is a recipient of several awards and achievements. He has won 2nd Prize in Medical Quiz for postgraduates at Diamond APICON Medicine Conference Bombay, Bharat Jyoti Award from NGO - India International Friendship Society, and Best Resident Doctor award at RGCI and RC from Hon'ble Vice President of India. He is a member of Delhi Medical Council and Karnataka Medical Council.